The cooling units from Hailea have been used in trusted waterchillers from other manufacturers for over 15 years. The new heat exchangers of the Ultra series are made from titanium. Therefore the chillers are perfect for watercooling systems. Another positive aspect about the Hailea units is the low noise emission. The pricing of the new series is also pleasantly affordable. 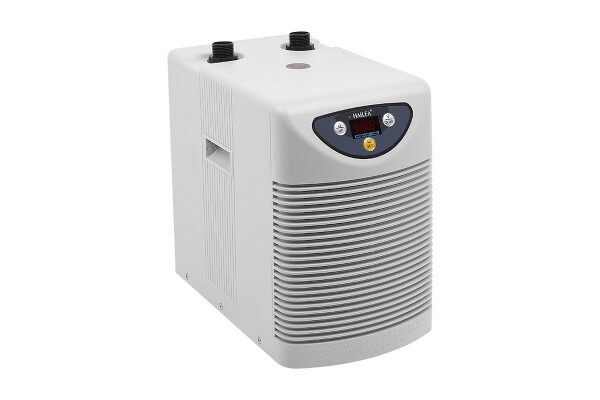 The small chillers (like HC150) have a noise emission of 20dB(A) only and can be used near the computer / aquarium without disturbing. The models HC1000 und HC 2000 should be extra decoupled or maintained in a seperate room. This waterchiller basically replaces the radiator as the coolant is chilled to the desired temperature by this unit. Temperatures down to 4°C are possible, please note that at low temperatures (high temperature difference) condensate may accumulate. Suitable insulation accessories are also available in our shop. Alternatively the coolant temperature can be set to just below room temperature to avoid this problem. Thanks to the low temperatures incredible overclocking potential is available! The lifespan of the components is extended by multiples. This system is also great for no-noise applications as the chiller can be located in another room. We recommend integration of the chiller into the cooling loop in combination with a radiator. This allows use of the chiller when required (overclocking, Benchmarks, summer etc..) and use of the radiator during normal operation. To estimate the required cooling performance here some non-binding estimates. The exact thermal emissions can be requested from the manufacturer of the hardware. The added values of your system must not exceed the given cooling capability of the chiller. What aquarium size can be cooled with my water chiller? We at Aquatuning wish to advise you that the manufacturer’s data was obtained under optimal circumstances. The temperature response of the aquarium may greatly vary because of insulation, heat from lights respectively sunlight. Hence we recommend using the larger model when reaching the upper limit of the aquarium size values. Notes regarding shipment: For shipping via parcel delivery (GLS) we have manufactured a specially padded carton. For handling and packaging we must charge 15€ incl. VAT. This charge is not charged when the Chiller is picked up or with pallet shipment if the chiller is shipped without the special packaging. Notes regarding compatibility: The chiller is shipped with fittings for 1" tubing (inner diameter 13mm). It is shipped with one pair of straight and one pair of 90° angled fittings. To use standard fittings the following adaptor is recommended: Art. 37018 for G1/4". If you should have problems with your chiller please contact us before returning the chiller to us. In most cases there is no actual problem with the chiller, but the functionality of the unit is not fully understood by the user yet. Please note the following: The compressor unit automatically switches itself on and off, if the temperature sensor is manipulated your warranty is void, the noise level or an allegedly not sufficient cooling performance are no reason for a reclamation. The chiller can only function properly if the cooling loop is equipped with a sufficiently powerful pump. If these facts are considered most reclamations can be avoided and you will greatly enjoy this product!